The Lattice Lace stitch is a lace stitch that resembles a lattice which has interweaving sections separated by lace. This stitch is a 12-row repeat and has excellent drape. Though the Lattice Lace stitch is not a difficult lace stitch, it is not recommended for “TV knitting.” Like most lace stitches, the Lattice Lace stitch requires stitch counting and attention to detail. 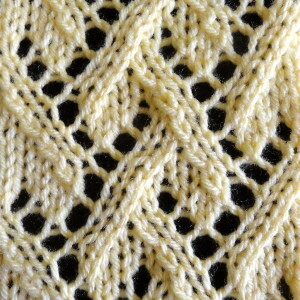 This lace stitch is perfect for light scarves, shawls and cowls. Stitches should only be counted after rows 5, 6, 11, and 12. Row 1 (RS): k1, *k2tog, k1, yo, k1, sl 1, k1, psso, k2; rep from * to the last 2 sts, k2. Row 2 and all even numbered rows: purl. Row 3: *k2tog, k1, (yo, k1) x 2, sl 1, k1, psso; rep from * to last 3 sts, k3. Row 5: k2, *yo, k3, yo, k1, sl1, k1, psso, k1; rep from * to last st, k1. Row 7: k4, *k2tog, k1, yo, k1, sl 1, k1, psso, k2; rep from * to the last 7 sts, k2tog, k1, yo, k1, sl 1, k1, psso, k1. Row 9: k3, *k2tog, k1, (yo, k1) x 2, sl 1, k1, psso; rep from * to the end. Row 11: k2, *k2tog, k1, yo, k3, yo, k1; rep from * to the last st, k1.